1. This blog is a forensic analysis of Sedgehill’s performance against the formal entry conditions for deploying a S60 intervention set out in statutory guidance from the DfE. I ask whether Lewisham LA are even allowed to use S60 when assessing these entry conditions. 2. My findings lead me to personally view this action by Lewisham’s head of Education as abuse of a statutory power. 3. I see no evidence-backed case whatsoever for deploying this S60 IEB intervention against Sedgehill school. a. Not a single one of the six optional entry conditions for S60 set out in statutory guidance from DfE appears to have been met unequivocally, though the guidance is very ambiguous and so open to manipulation (I have attempted to transparently use my interpretation of the DfE guidance). Two (progress below median, and sudden drop) can be argued as being met, but I argue these fail the ‘reasonable’ test. c. More importantly Sedgehill appears to be performing well when controlling for the very high %FSM cohorts, compared to Lewisham peers and the nonsensical set of 55 national schools used by Ofsted as comparators. 5. DfE guidance for s60, and the processes involved, must be made far more testable and fair in order to protect other schools against attempted abuse of power. Skip this section and jump to ‘CHECKPOINT’ if you know the story so far. Lewisham LA wants Sedgehill to do better. Specifically, they want Sedgehill to do better at getting higher results for kids on free school means (FSM – the educational proxy for ‘disadvantaged’). The main criticism is that these kids are ‘too far’ behind the non-FSM cohort. Sedgehill also wants Sedgehill to do better. It has been doing better for several years, both against its own results and against the flat improvement trajectories of other Lewisham schools. But it started in a really bad place before the current leadership team joined, and so had a long road to travel. An autumn 2013 Ofsted inspection revealed that the leadership and behaviour was rated as ‘good’, but that the school needed to get better at maths and needed better results overall still. No one disagrees with that, and the school thinks it has a compelling plan in place to achieve it. Lewisham local authority this autumn ’14 decided that the school was not improving fast enough for their liking, and they expressed a vote of no confidence in the likelihood of the school improving fast as a result of recent enhancements to the school improvement strategy. Lewisham decided they had a better idea than the school’s governing body’s own idea. They have a view that to accelerate Sedgehill’s improvement, they should remove the entire governing body and head teacher (the ones who have already turned the school around from a total car crash), turn it into a sponsored academy, accountable directly to DfE (financially and in terms of results and improvement – i.e. ‘off lewisham’s books’) and they have picked a celebrated Academy and Head Mark Keary at Bethnal Green to be the sponsoring academy. Basically, completely rebuild the school’s governance and leadership team mid-way through the academic year. No, I’m not kidding – Lewisham honestly say that this will be good for the pupils, rapidly and sustainably. Lewisham asked the school what they thought of that idea, and the school researched it in great detail including visits, but decided their own idea would deliver more improvement, faster, and also not cause massive disruption to existing pupils. The school also noted that the current GCSE cohort (the first cohort not to have started school life under the old sedgehill leadership team) is already on track for a barnstorming 65% A*-C(inc english and maths), thanks to the existing team’s improvement plan execution. They basically said “we’re not broken so there’s no need to fix us thank you”. For details on why the school formally thinks Lewisham’s idea is not fit for purpose, see http://www.sedgehill-lewisham.co.uk/uploads/document/Consultation_response_on_establishing_an_IEB_at_Sedgehill_school.pdf . See my previous post on how Lewisham has still refused to reply to the obvious challenge that the mid-year smash-and-rebuild will do more harm than good and so not meet the objective of rapid sustainable improvement ( http://uk-youthviolence.blogspot.co.uk/2014/12/lewisham-la-still-dodging-central.html ). The very next day after the school refused to comply with Lewisham’s preferred idea, Lewisham deployed a ‘section 60’ intervention as set out in the DfE’s guidance for ‘schools causing concern’, which DfE published in May 2014 (https://www.gov.uk/government/publications/schools-causing-concern--2). It transpires Lewisham’s head of education in fact threatened this action if the school did not agree to her idea for the school to be torn up and rebuilt mid-year (as an academy). I’ll leave you with the question – should a statutory improvement power be wielded as a threat, or merely implemented when judged it is fair and proportionate to the circumstances? Okay well done for getting this far. We’ve seen that Lewisham have deployed a drastic power, ostensibly to secure rapid improvement. And we’ve seen that the school thinks it has a compelling improvement plan in place that is set to deliver record GCSE results this summer, after which no local authority could dare or succeed to deploy a crisis improvement power. So now let’s look at that power in detail to see whether the power is being used in the way that it was intended. It may be relevant to note that four years ago, the same Lewisham head of education attempted to force through an academy conversion at the same school Sedgehill, but was blocked by the governing body and was not very happy at all with that outcome. So let’s look at the formal S60 entry conditions. Here’s where it gets tricky so go grab a coffee. The DfE’s official guidance on using this drastic power is so appallingly ambiguous and subjective that I feel the guidance should be torn up and rebuilt mid year! But hey it was published and so it is gospel. To help you see the fluff, I’ve put in red font every phrase/word that needs further definition in order to be fully fair and objective. 3. the safety of pupils or staff at the school is threatened (whether by a breakdown of discipline or otherwise). III. the standards attained by pupils at comparable schools. Not one of these terms is defined in the DfE document, which I think is a shocking state of affairs. So is Sedgehill’s performance “unacceptably low”? a. Attainment: The floor for ’13 and ’14 results was set at “40% of pupils achieve five or more GCSEs at grade A*-C”. Sedgehill got 53% in ’13 and 44% in ’14 (with 65% projected for ’15). So Sedgehill are above the floor. b. Progress: the rules the DfE have set in their ‘floor’ definition (http://www.education.gov.uk/schools/performance/fs_13/index.html ) are that a school has to beat the median score for %pupils making ‘expected progress’. I don’t have these figures but suspect sedgehill will be below the median score – and by this definition (median) exactly half of all schools in Britain will also be below the floor – I don’t think this an ‘acceptable’ justification for deploying a S60 intervention!! a. I have no idea how to assess this as ‘low’ isn’t defined. Sedgehill’s FSM cohort performed worse than the rest, yes, but that is a national rock solid correlation – see DfE website “Children from disadvantaged backgrounds are far less likely to get good GCSE results. Attainment statistics published in January 2014 show that in 2013 37.9% of pupils who qualified for free school meals got 5 GCSEs, including English and mathematics at A* to C, compared with 64.6% of pupils who do not qualify.” I think that Sedgehill has beaten that 37.9% score for its FSM cohort, but can’t confirm yet. 3. “a sudden drop in performance;” YES, but NO: Sedgehill saw a big drop in ’14: 44% down from 53%, but DfE and Ofsted have advised LAs not to use the drop in ’14 as evidence for any action, because of changes in how the measures were calculated, and changes in the exam styles. There was a ~7% points drop seen nationally. And I understand this was a specifically difficult cohort who started school under the old leadership team and had a very bad start to KS4. a. There’s no definition for ‘underperformance’ so I’ll assume they mean the ‘floor’ again. In ’11,’12, ’13 and ’14 Sedgehill was above the floor for GCSE results. That is sustained not-underperformance. a. I have no idea what is unacceptable, nor what is expected, nor what is performance. So this measure is basically illegal because it is unquantifiable. Also, see (2) above. b. So, I think it would be fair to compare Sedgehill against schools with a similar %FSM cohort and %boys. I’d also suggest an urban setting and size of school. Sadly I don’t have time or data for this task. But I have looked at the set of 55 schools used as official comparators on the Ofsted ‘dashboard’ (see http://uk-youthviolence.blogspot.co.uk/2014/12/sedgehill-ofsted-performs-unfair.html ) and I find it a grossly unfair comparison – but even by that silly group Sedgehill is doing better than many schools with an FSM share of 20-50% - sedgehill was at 54% for that year compared. I saw the same trend for the small group of Lewisham schools – Sedgehill is not an outlier. So I think Sedgehill is not in any way a dramatic outlier or underperformer when compared with similar or even less challenging FSM schools. On the boys thing, Sedgehill has had an unusually high %boys, which again will mean it is unsafe to compare too directly against schools with far more girls who perform better, and it will tend to make Sedgehill results look worse than they are, taking this into account. 6. I see no evidence-backed case for deploying this S60 IEB intervention against Sedgehill school. 8. I therefore personally view this action by Lewisham’s head of Education as abuse of a statutory power. I also think it is inappropriate behaviour to wield this power as a threat. 9. DfE guidance for S60, and the processes involved, must be made far more testable and fair in order to protect other schools against attempted abuse of power. Ofsted offers a summary view for every school. Sedgehill can be seen here . It is a concise report that shows some of the key measures for the school. But crucially it also adds a comparison to a list of so called ‘similar schools’. The list is here. I found that Sedgehill has been compared against a list of 55 schools that I don’t find to be similar in one very important respect: % Free school meals. It also includes two GIRLS SCHOOLS and two GRAMMAR SCHOOLS who unsurprisingly have good results and so skew the data. But I trimmed those ridiculous four out to look at the rest and see where we sit. I decided to go through the data, build my own spreadsheet and plot %A*-C(inc English&Maths) against %FSM. This was all for the summer 2013 GCSE results. (this is already well known) there is a very clear trend/correlation between exam results and %FSM in the set of schools Ofsted compared us against. 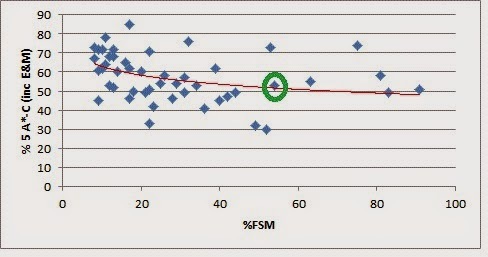 Lower %FSM, higher exam results (note the concentrated cluster to the far top left), and vice versa. There are some notable exceptions: once the %FSM goes much above 50ish, the results seem to go up! As if these schools are free to develop a FSM-centric strategy that helps get the best out of the kids maybe? But crucially, the vast majority of the 20%-50% FSM set of schools underperform relative to the trendline for the whole set. 23 of the supposedly 'similar' schools had FSM 20% or below! That’s almost half the comparison set. 12 had FSM 12% or below – these are ‘wealthy’ schools that bear no comparison to ours whatsoever. Sedgehill was actually bang on the GCSE results trend line compared to the other schools in the set, meaning that once you take into account the high %FSM we have, we were doing as well as most schools. We were not by this measure underperforming at all. We were not, however, performing highly either, and that is an aspiration that I’m sure we all share – we want to be above that red line in the set of schools who do very well despite their high %FSM cohort. Sedgehill was in fact doing better than most of the schools with %FSM in the 20-50% range – you can see them clustered well under the red line. That means we outperform a lot schools who are less disadvantaged than us! Why am I boring you with this geekery? It's just more evidence for my central point: Lewisham is acting on a groundless case. The Lewisham education department has launched a 'section 60' intervention against Sedgehill, and based it on an allegation of 'unacceptably poor performance'. But as Martin Powell-Davies has shown Sedgehill was one of Lewisham's most improving schools during the last few years. And now I've shown that compared to a set of schools around the country Sedgehill is actually doing unusually well considering the extremely high % of kids eligible for Free School Meals. (It would be interesting to repeat this FSM/GCSE comparison for just Lewisham schools). They are using 2014 GCSE data as the centerpiece of their argument, when the Dept for Education expressly said that '14 data cannot be directly compared to previous years. This point alone should ring dodgy alarm bells! They are ignoring the detrimental effect that will come from the disruption if an IEB is imposed on a school that does not support it. *Some of you may be thinking "yes BUT isn't the whole point that we need to get better results from disadvantaged kids?" Well yes of course that's a point. But all I'm focused on at the moment is that Lewisham have singled out a school that is not performing anywhere near badly enough to warrant the use of this extreme intervention. And, crucially, there's no sign that Sedgehill are heading that way either. If they were, as a parent of a year 7 just started there, do you think I would be supporting the current leadership team?? It's time for Lewisham to come to the table and look at a compromise way of working TOGETHER to make further improvements. Share in the success story. There's no shame in changing your minds, if your priority is the wellbeing of Lewisham children. Lewisham are confident that Ofsted back their view, because it was in fact Ofsted who rejected the governing body's appeal against the warning notice. However I note that crucially they chose not to answer the most central question I posed: "Why you think the extreme disruption this will inevitably cause will achieve better outcomes for the children." The school thinks it is on track for rapid, sustainable, improvement, under existing arrangements including a detailed improvement plan already supported by another high performing school. The LA and Ofsted both think it is not. "The LA should be able to demonstrate... that recovery / improvement is more likely as a result of the IEB being established"
There is strong evidence to the contrary. But so far the LA is silent and must come forward on this point. Finally, I note with interest one little sentence in today's reply: "The risk that this may lead to intervention by the Department for Education is too great. None of us would want that to happen." I do wonder what MS Sulke means by this - I'm trying to think what could be worse than what the LA is already proposing. But I can imagine how it would be awkward for the LA. I hope this is not part of their incentive set here. Thank you for your e-mail to Frankie Sulke on 10th December 2014. You ask about our grounds for issuing the warning notice and the appeal process. We served a warning notice under Section 60 of the 2006 Education and Inspections Act on 24 October 2014. We have a duty to do so in a range of circumstances, including where we consider there are unacceptably low standards. This is not disputed by the governing body of the school. They agree that current outcomes are too low, pupils do not make sufficient progress and that the achievements of those pupils for whom the school receives a pupil premium (some 55% currently) are unacceptable. However the governing body challenged the warning notice, which is their right to do so. Consequently our warning notice was reviewed by Ofsted. In the course of this review they scrutinised the evidence received from the Chair of the Governing Body and from the Council and also reviewed the most recent inspection reports and published performance data. This then gives us very good insight into Ofsted’s current thinking, which I believe addresses your second question. This is what Ofsted said in rejecting the appeal against the warning notice: “Improvement has not been consistent, rapid enough or sustained over time. Consequently, this review finds that the scale of issues facing the school is significant and raises concerns with regard to the capacity of the school to raise standards sufficiently and rapidly. I do not believe in these circumstances that Ofsted would be happy to wait a bit longer, as you suggest we should do, without further inspection. Rather, it is very likely that the school would have been subject to a 'no notice' inspection by Ofsted. These have recently been introduced for schools which are particularly causing concern on their data. The risk that this may lead to intervention by the Department for Education is too great. None of us would want that to happen. Neither do I think that armed with this full knowledge, we can or should wait to act. The Council has a duty to all the children and young people who are educated in the borough and we feel very strongly that for the sake of the progress of the pupils attending Sedgehill now and in years to come, decisive action must be taken to address the very real challenges the school faces. My letter to Lewisham concerning their intention to oust Sedgehill school's governing body and head. Most of the planet will not be aware but there is a growing battle raging around the future of a south London school. Sedgehill is a large (~1400) community school who achieve amazing results from a cohort which includes kids coming in with below-target achievement out of primary school. Their sixth form is going from strength to strength. And crucially they provide Education with a capital E: they produce animated, engaged, confident aspirational citizens who are allowed to develop whichever strength they happened to be born with - even if it isn't always a strength which leads to 5 A*-C (including English and Maths). In summary, they are using a niche power reserved for a school in collapse (ejecting the governing body and headteacher; imposing an Interim Executive Board; and converting to an academy under Bethnal Green's sponsor academy - all this against the overt will of the GB, the parents and the children and teachers) If you like Twitter search on the #Savesedgehill hashtag to get more context. I'd simply like to share a letter I just emailed to Frankie Sulke's team (head of Education at Lewisham), after my specific qus were unsatisfactorily replied to with a copy+paste of yesterday's statement from Lewisham (http://www.lewisham.gov.uk/news/Pages/Statement-on-Sedgehill-School.aspx). "Thanks for your response, but I would prefer a rather more personalised response. Your statement does cover some of my questions, but the following three remain unclear to me. 1. What the appeals process is. I have now learned that the imposition of the IEB was only possible after you issued a ‘warning notice’. And that the warning notice can only legitimately be issued under certain very specific circumstances. I would like to know what the appeal process is against that specific decision to issue a warning notice, as I fear it has been issued in error/without a defensible evidenced basis. 2. Why you are going beyond the existing framework of ofsted inspections/actions. In your statement you strangely imply that you know what Ofsted is currently thinking about Sedgehill, and what it might conclude if it visited again. Assuming Ofsted is independent, all you and I can possibly know right now is what was written in the Autumn 2013 report. The parents and governers both think the school is on a safe sustainable trajectory to lasting success. The imposition of an IEB will radically destabilise the whole fabric of the school. I believe you should back out of this process and leave it to Ofsted and the governing body, but provide the excellent support that your education department is equipped to provide. Furthermore an IEB, by its very definition, is reserved for a collapsing school, where a radical change would be welcomed by the parents and children. Look closely into Sedgehill and you will see that not one of these groups thinks Sedgehill is anything other than a growing success story that simply has not yet come to fruition. Look at the Ofsted ‘Parent View’ and tell me that it is not abnormally positive compared to even some star schools. 3. Why you think the extreme disruption this will inevitably cause will achieve better outcomes for the children. Please answer this question. I foresee guaranteed downside if an IEB and new head are imposed against the will of the parents, governors, teachers and children. In exchange for this guaranteed downside I have no evidence to believe that an IEB and new head will deliver an upside over and above what the current team is already on track to deliver, sustainably. On the other hand, if you leave the current team in place but support it meaningfully rather than combat it, you will get the outcome that you want (improvement in GCSE results and higher uptake)but without probably years of trauma and disruption that will in my opinion lower the achievement of children who have to live through the transition. I fundamentally believe that whilst you have the best intentions at heart, the solution you are proposing does not stand up to logical scrutiny, has no democratic mandate as it is unsupported by all groups, and will definitely cause far more problems for yourselves than it may solve. I offer you a challenge. Come back in September 2015 after this year’s results. Look at the projections for the cohorts lined up behind them. Look at the next Ofsted report. And go from there. Basically wait a bit longer. If you are right and the current team fails to deliver on their projections, you will find you have the support you need. If you are wrong then you can safely disengage and let Sedgehill continue to grow in success. What is there to lose? I ask you – why would I be saying all this, as a parent of a year 7 pupil, when I obviously want the absolute best for him? Unless you also have children at Sedgehill, how can you think your view should override those held by parents? Parents pay the taxes and give the mandate to Ofsted and the elected local authority to act on our behalf. If you are acting against all of our wishes then something fundamental has broken down and ultimately will not prevail.